The intent of the Air Force Memorialization Program is to provide a lasting honor and pay tribute to deceased and living Air Force military and civilian personnel with records of outstanding and honorable service. Goodfellow AFB, in accordance with Air Force Instruction 36-3108, has uniquely named the installation itself and its streets, buildings, rooms and other permanent facilities to recognize and memorialize some of these very deserving individuals. This webpage is an updated version of a 2001 pamphlet developed by the Goodfellow AFB wing historian. It is provided here as a public service by the EC-47 History Site 50th Vietnam War Commemorative Partner Program Committee. 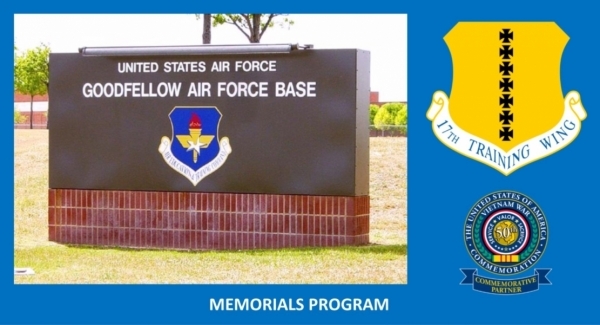 Goodfellow AFB is also a registered commemorative partner and we appreciate this opportunity to work together to highlight the Vietnam War veterans and others recognized through the base memorialization program. Click on an icon below to start your review.